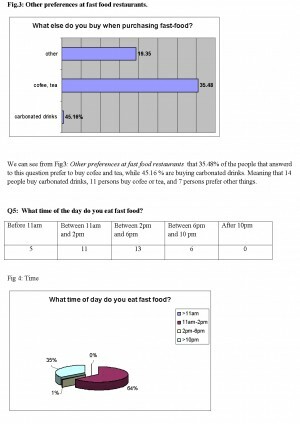 From this study we wanted to find people's preferences, the importance level they give to fast-food in their life, how often do they eat this kind of products and also if they know anything about obesity. 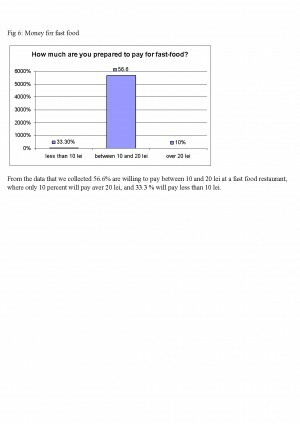 The research has been made on a sample of 29 persons having the age between 18 and 50 years old, in Brasov. From the total sample that have been interviewed 18(62%) are female persons and the rest of 11(38%) are male persons. Most of the persons that have been interviewed have the age between 18 and 30 years. The survey itself was conducted in 1 day, it took three hours, each team member covered a specific area. Interviews were conducted on Republicii street and on Transilvania Faculty, Colina. Sample size was 29 people, 16 questionnaires were administered at Republicii Street and 13 on Colina. 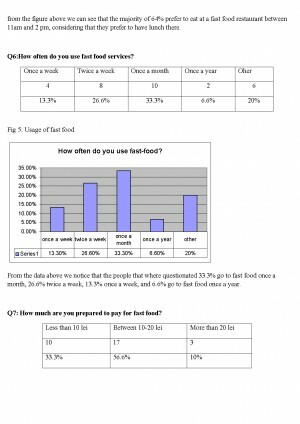 - The level of knowledge the sample has whe it comes to obesity. Fast food is the term given to food that can be prepared and served very quickly. While any meal with low preparation time can be considered to be fast food, typically the term refers to food sold in a restaurant or store with low quality preparation and served to the customer in a packaged form for take-out/take-away. In 1867, Charles Feltman, a German butcher, opened up the first Coney Island hot dog stand in Brooklyn, New York City, though the origin of the term is in dispute. The World's Columbian Exposition (Chicago 1893) and the St. Louis World's Fair of 1904 are credited with mass promotion of a number of portable foods, including the hot dog, the ice cream cone and iced tea. 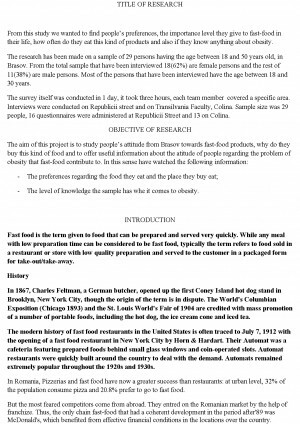 The modern history of fast food restaurants in the United States is often traced to July 7, 1912 with the opening of a fast food restaurant in New York City by Horn & Hardart. Their Automat was a cafeteria featuring prepared foods behind small glass windows and coin-operated slots. Automat restaurants were quickly built around the country to deal with the demand. Automats remained extremely popular throughout the 1920s and 1930s. In Romania, Pizzerias and fast food have now a greater success than restaurants: at urban level, 32% of the population consume pizza and 20.8% prefer to go to fast food. But the most feared competitors come from abroad. They entred on the Romanian market by the help of franchize. Thus, the only chain fast-food that had a coherent development in the period after'89 was McDonald's, which benefited from effective financial conditions in the locations over the country. According to the study ISRA Center, McDonald's restaurants have the highest reputation among Romanians, as mentioned by the majority of people interviewed: 57% spontaneous and 99%, assisted. Also, 73% of respondents who use frequently fast-food restaurants said that they often go to McDonald's, and 95% were at least once. At the national level, McDonald's, KFC and Spring Time are the first in the top restaurants serving fast-food that respondents either said that they went at least once, whether they attend on a regular basis, whether they prefer. Descarcă referatul cu titlul "Research - Fast Food" cu plata prin SMS pentru 4 € + TVA. Plătești un referat și primești 2 (al doilea gratis).